High Waist Wide Waist Core Support Back Support New Design Jodhpurs for women with a tummy. The waistband has wide 10cm belt loops for a belt or can be removed for looks. Suede seat uniquely designed with "gaps" to provide tension release when moving. Oh my goodness where have you been all my life. I have had so much hip and pelvic pain from riding my Friesian (who is a bit like riding the kitchen table) those joddies are amazing thankyou Lisa. Peta Smith recommends Applied Posture Riding: "This year I decided to spend my ‘birthday money’ on myself and invested in a pair of core support suede seat breeches from Annette. I’ve needed to wear a back brace when riding for almost 30 years, but today rode without it because I felt so supported in these breeches. They have the comfort of tights but are a LOT more flattering on. I’d thoroughly recommend these to any rider in any discipline." 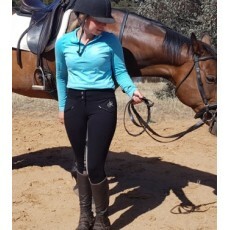 Peta recommends Applied Posture Riding: "This year I decided to spend my ‘birthday money’ on myself and invested in a pair of core support suede seat breeches from Annette. I’ve needed to wear a back brace when riding for almost 30 years, but today rode without it because I felt so supported in these breeches. They have the comfort of tights but are a LOT more flattering on. I’d thoroughly recommend these to any rider in any discipline."